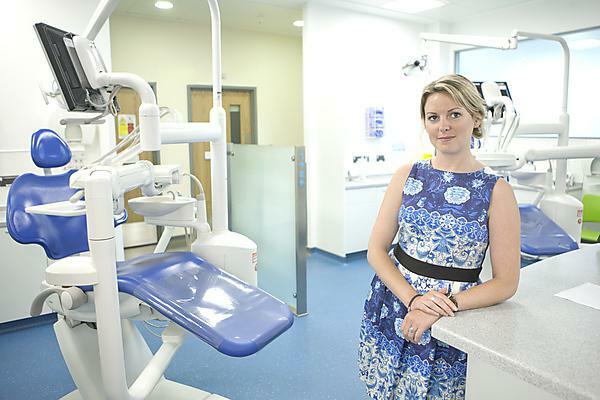 Dr Louise Belfield is something of a pioneer in her field: in 2013 she became the first dental nurse in the country to achieve a PhD – and she’s now using that expertise as a lecturer in biomedical sciences at the Faculty of Medicine and Dentistry. "I came into higher education through a non-traditional background, so studying at Plymouth opened a host of new possibilities for me. It allowed my curiosity to flourish and I could pursue my interest in human biology. Both my undergraduate and postgraduate degrees prepared me well for life after graduation. "During my undergraduate degree, I became fascinated by the complexity and ubiquitousness of the immune system, so when I graduated I wanted to continue my exploration of immune cell function, combined with my background in dentistry. I enrolled on a PhD programme to investigate immune cell function in oral disease." "I have been fortunate enough to progress in the academic field. After completing the PhD, I became a lecturer in biomedical sciences, where I continue to pursue my research interests. Here, I am also involved with design and delivery of the dentistry programmes, and supervise several PhD students. "To work in research, you have to have a good foundation of knowledge in your chosen field. When I graduated, I had the relevant knowledge base, and I gained the invaluable transferable skills, such as presentation, communication, networking, and analytical skills, needed for a career in academia." "Keen to maintain my dental background, my dissertation focused on the effects of titanium dioxide and calcium phosphate on macrophage responses to Porphyromonas gingivalis lipopolysaccharide – essentially investigating how cells of the immune system behave when they are involved with oral cancer or chronic inflammation. After graduating with my BSc, I continued to study oral immunology in a PhD entitled “Interactions between pathogenic bacteria and macrophages in oral pathology”. "My research interests lie in how oral bacteria can modulate the normal function of the immune system and drive conditions that lead to development of diseases, such as chronic periodontitis and oral cancer. regulation of tumour angiogenesis in response to periodontal bacteria." "Being a scientist requires you to travel and present at international scientific conferences, and these tend to be in places you might not ordinarily pick as travel destinations. So I have got to see cities in Europe and the US that I might not have had opportunity to, had I not been in this career. "A recent trip to New York University Dental School to see how they implement inter-professional education was especially rewarding, and we have brought back exciting ideas to incorporate into our own curricula. And ultimately, generating data that has potential to impact on patient treatment is really exciting too." "In research, you should pick a subject you are passionate about, as that will drive you through any tough times you face. Resilience and persistence are two character strengths needed in this career: be persistent, look for alternative routes, and network. "There have been plenty of challenges but I don’t think I would change anything. Challenges are a learning opportunity; they have shaped me and the decisions I have made, and I am happy to be where I am today. My advice to anyone wanting to do the same? If you want it hard enough, you will find a way to make it work. Even closed doors open if you push them hard enough!" "The support I have received so far from Faculty of Medicine and Dentistry has been wonderful, and has helped me to achieve both career and academic ambitions." "There is a buzz about Plymouth"
"Treasure your student days – this is your opportunity to immerse yourself in the subject that you love, and to make your best friends. During my undergraduate degree, I was chair of a voluntary student first aid group. One of my favourite memories is of making a giant cardboard ambulance. We dressed up as hospital staff and patients, and drove the card-ambulance around Plymouth on a fundraising evening. It took ages to make and at the end of the night, it rained, turning the card-ambulance in to paper-mache." "My favourite memories of studying are probably of those days where we would take our notes and a barbeque, and study on the Hoe overlooking the sea on a warm sunny day. The University has a warm, friendly and welcoming student community, supported by passionate and dedicated staff. There is a buzz about Plymouth; its history, coastline and proximity to AONB, and its growing cultural scene. It has the amenities of a larger city but everything is within walking distance. Plymouth is a great place to be right now." Interested in human biosciences/biomolecular sciences? The School of Biomedical and Healthcare Sciences is based in a new, purpose-built building linked to the Faculty of Medicine and Dentistry at Derriford. Take a look at the range of courses on offer. Find out everything you need to know about the range of postgraduate research degrees and current studentships offered by the Faculty of Medicine and Dentistry.